This is plate 20 from Robert Melville Grindlay's 'Scenery, Costumes and Architecture chiefly on the Western Side of India'. Grindlay (1786-1877) was only 17 when he arrived in India in 1803. He served with the Bombay Native Infantry from 1804 to 1820 and during this period made a large collection of sketches and drawings. Mahmudabad is the old name for Champaner, in Gujarat. 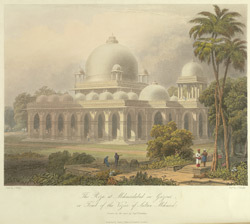 Grindlay described this building in Mahmudabad, "[situated] in a beautiful grove of mango-trees", as containing "three tombs of white marble, covered with silk, having a canopy of silk suspended over them, to which are attached a great variety of little offerings of images, flowers, and ornaments, continually added to by the visitors, who thus hope to obtain the intercession of the saint or chief in their appeals to heaven."